US ceiling sales will rise 4.1% annually to $2.4 billion in 2020. In area terms, ceiling product demand will reach 1.6 billion square feet. Stretch ceilings will enjoy the strongest gains, while clouds and baffles will take share from wall-to-wall ceilings. The dominant nonresidential market will continue to drive ceiling product demand. 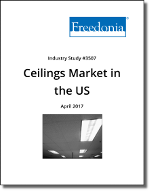 This Freedonia industry study analyzes the $2 billion US ceilings industry. It presents historical demand data (2006, 2011, and 2016) and forecasts (2021) by product (ceiling tiles, suspension systems, specialty products), market (nonresidential and residential), region (Northeast, Midwest, South, and West), and building type (office, commercial and lodging, institutional, and other nonresidential buildings). The study also evaluates company market share and competitive analysis on industry competitors including Armstrong World Industries, USG, Saint-Gobain (CertainTeed), ROCKWOOL (ROCKFON), and Hunter Douglas.